STOWE, VT – The results are in! For the seventh consecutive year, Global Traveler conducted its GT Tested Reader Survey, asking frequent business and luxury travelers to name the best in a variety of travel-related categories. More than 25,000 people responded. Over the past seven years, Global Traveler’s consistent, unbiased reporting has placed the GT Tested Reader Survey among the most highly regarded in the industry. 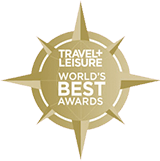 This year, Global Traveler‘s distinguished readers recognized airlines, hotels, loyalty programs and travel-related products in 62 categories. The results of the survey are announced in the December 2010 issue.